Home » Articles » Music » The Brian Setzer Orchestra’s 15th Anniversary – Christmas Rocks! The Brian Setzer Orchestra’s 15th Anniversary – Christmas Rocks! Get in the Christmas spirit at Taft Theatre this Tuesday! SiriusXM presents The Brian Setzer Orchestra’s 15th Anniversary this Tuesday Nov 20 at Taft Theatre (317 E 5th St. Cincinnati). Doors open at 6:30 p.m. and the magic begins at 7:30 p.m. 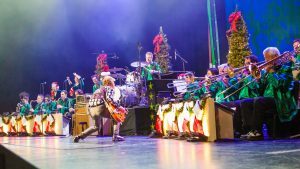 The iconic guitarist, songwriter, vocalist and three-time Grammy-Award winner Brian Setzer and his 19-piece orchestra whip up a huge dose of retro holiday cheer with their 15th Anniversary Christmas Rocks! The acclaimed show also features music from their four best-selling holiday albums, as well as original Brian Setzer hits. Consistently cited as one of the world’s greatest living guitarists, Setzer’s trademark guitar work and vocal stylings are matched with the Brian Setzer Orchestra’s rockin’ big-band horn arrangements—an unbeatable combination guaranteed to rock you into the holiday spirit! Tickets are $36, $46, $56 and $67 and can be purchased online at https://www.ticketmaster.com/the-brian-setzer-orchestra-tickets/artist/844650. Feel the magic at Taft Theatre!